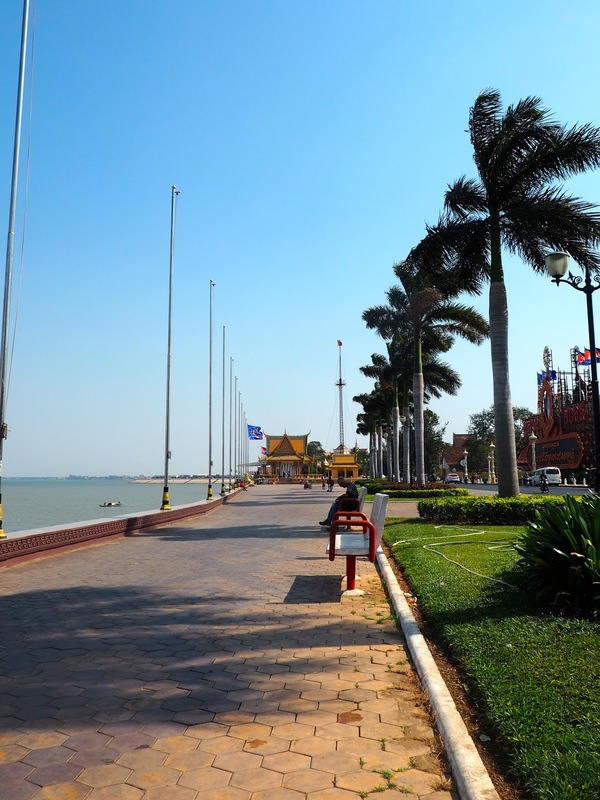 So this post is actually out of order in relation to my other Cambodia posts, which are already published, since Phnom Penh was actually my first destination in the country. However, I left it until last as we spent another night there right at the end of the trip, and there was the possibility of us visiting something else in the city, so I thought I'd leave it all for one post. We ended up doing no such thing though, as we were so exhausted from the rest of the trip that we just slept in before going to the airport. Anyway, I arrived in Phnom Penh back at the start, by myself as Matt had to work for a couple extra days, so he ended up not really seeing much of the city, while I had two days there to explore before he arrived and we left for Siem Reap. My flight landed mid-morning, an hour or so delayed after my stopover in Ho Chi Minh City, and I jumped in a taxi to get to my hotel for the night, NaNa Hotel, which was in the same vein as the rest of our accommodation - cheap and nothing luxurious, but clean enough and did the job. I had the rest of the day to look around after that, and since the city centre is fairly compact, I decided to roam the streets, as is my preferred means of exploring. This seemed to be an entirely foreign concept to the locals though, as I received offers of tuk tuks and motorbikes every few minutes, either from those parked by the roadside, or from drivers slowing down to call out to me, all of which I declined with a shake of the head. They were well meaning enough, but it seemed pretty obvious to me (though not to them) that I could have hailed one very easily if I'd wanted, and was surely therefore uninterested in one if I wasn't doing so! The city was certainly full of motorbikes at any rate, though it wasn't quite as intense as Ho Chi Minh. I was able to put my newfound road-crossing skills to use though, as it was the same scenario of simply dodging the traffic - if you wait for it to stop, you'll be there all day, quite literally. There was one lady wheeling a drinks cart/tuk tuk across the road who seemed to get rather annoyed at my trying to cross there too, far more so than all the actual drivers, but I quickly skirted past her and hurried on my way - I'd rather not get into an argument, thanks! Roaming the streets made it apparently quickly that Cambodia is very different to Hong Kong, mainly in being far less built-up and developed. Phnom Penh may be the capital, but it's not a huge place, and there is very much a feeling of old meets new around the city. Some parts are very basic and simple, but then there are chain stores plonked in the middle of it all. It's not a wealthy country at all, and that started to become more obvious as I walked around. I was reminded of Central America at moments, but then it was also entirely unlike it too. There are also traces of its colonial past, with signs written in both Khmer and French, and European hints to the architecture, mingled with Asian-style pagodas. I saw some entirely random sights along the way too, such as a motorcyclist laden down with dozens of dead chickens hanging from his bike! I headed to some of the city's main tourist spots that afternoon, starting with a walk through the parks that are home to the city monuments, the Independence Monument and the Friendship Monument, which both looked clearly Asian in style - the French touches to the city are much more subtle. This looped me round to the Royal Palace, the main sight in the city centre, which does cost a few dollars to enter. A point to note here for anyone thinking of visiting Cambodia - the official currency is the riel, but US dollars are accepted everywhere. We only took dollars, but they don't circulate coins, so tended to receive change in riel. There is a dress code inside too, with knees and shoulders having to be covered up. I was rather taken aback when I first walked aside, not because of the buildings - though I'll get to those - but because I immediately clocked a security guard taking a piss in a corner, while another stood nearby. Just as you do I guess... Anyway, after that little surprise, I turned my attention to the buildings. The Palace is composed of several buildings, all in the Asian architectural style that I associate with South East Asia, as it is quite different to the Chinese temples of Hong Kong. I'm not versed enough in architectural terms to explain this properly, but these photos should show you what I mean. There were lots of triangular shapes, spires perched atop the roofs, and pillars stretching up the sides of buildings. The gardens around the buildings were all very geometrical and symmetrical as well, matching the architectural style. I liked that I could spot animals within the designs, as the shapes coming out the corners of the roofs reminded me of elephant trunks, while the edges resembled dragon tails, and monkeys clung on to the tops of the pillars. The silver pagoda is next door to the palace, and included in your entrance, and is equally impressive from the outside. The interior of both the throne room and pagoda were somewhat less enthralling to me though, being rather plain in comparison, which is perhaps further proof of the country's lack of wealth. Regardless, it's still a sight worth visiting. It was also the first time I felt I didn't stand out in the city, as it was full of other tourists. During my earlier walk I had encountered very few other foreigners, and been on the receiving end of a lot of stares from locals. I'm somewhat used to this, as I get it in Hong Kong too, but there are other expats there at least, and it felt far more obvious here somehow. The riverside is one of the busier areas of Phnom Penh I discovered, and host to plenty of hotels and restaurants, so there were even more tourists about - so less people staring at me thankfully! It was quite a nice walk around too, especially in the sunshine, which was been severely lacking in Hong Kong recently. The big park opposite the Royal Palace was flocked with pigeons, which wouldn't be worth mentioning on its own, but there were some young boys running around causing them to scatter, but they also managed to catch one from time to time, and then release it again. They caught my eye as they did so, and burst into giggles, causing me a smirk too. It was a recurring theme of the whole trip that young children would stare more obviously than older ones or adults, but if I gave them a smile they almost never failed to smile back, or even giggle or say hello. What can I say, I like kids - would I be a kindergarten teacher if I didn't? I walked up the river, and then came across one of the city's larger wats, Wat Ounalom. There was yet another tuk tuk man outside, who began speaking to me, mainly to see if he could take me somewhere after I was done. I didn't need a ride anyway, however, his sales tactic involved addressing me as Lady Gaga the entire time? I even saw him again in the same area the next day, and he did it again, and I'm not really sure why, as I wasn't dressed any differently to most other Western tourists in the city. I'm not really sure how he thought that would work either! Anyway, the wat itself was a continuation of the architectural style of the Palace, with more spires and bright yellow colouring, and a large Buddha sitting at the front. I didn't feel like I learned a ton about Cambodian history and culture during this trip - something I should look up though - but I did learn that most of the country, and its religious sites, were originally Hindu, and converted to Buddhism later. 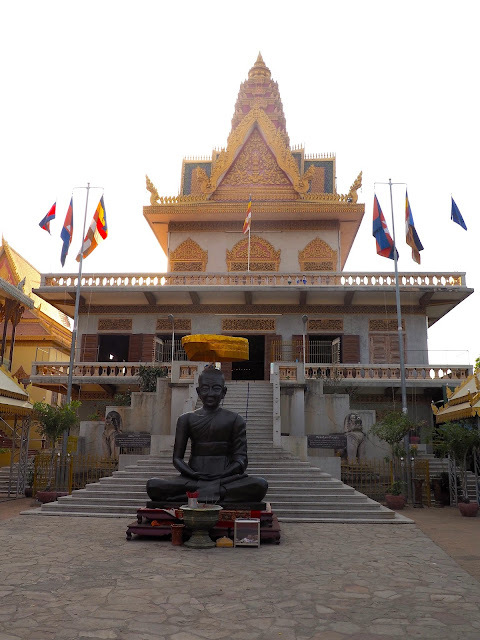 As I wandered around this wat, there was a smaller building at the back, with an old man sitting outside, who quickly stood up and beckoned me over. I approached with some hesitation, having been taught to be wary of strangers, but he had just let another girl out of the building. He opened the door and ushered me in, flicking on the lights to reveal a Buddhist shrine, decked out in neon lighting - something I encountered in several Cambodian wats actually! He let me look around and take some photos, then got me to kneel down and started what I presume was a blessing. I lit an incense stick and placed it in a pot, then he shook sticks to fleck water on me, while chanting some Khmer, before putting more water in my hands and indicating for me to wash my face. I didn't relaly know what was going on, but figured what the hell, and went with it. Naturally, he then gestured for me to leave a donation, as I had guessed from the start, so I left a little bit. I'm not sure if it was a real blessing, or whether I may have been swindled, but it was a story to now tell, and it's not like I gave away that much. I had a quiet evening in that night, as I was alone, and I'm still not really comfortable eating out by myself, so I just snacked throughout that day. The next morning I woke up feeling very light-headed - the beginnings of the illness that stayed with me through our time in Siem Reap - so spent the morning in bed, waiting to check out of the hotel as late as possible. This was also because I then had around 8 hours to kill around the city, before Matt arrived and we got dinner before catching out sleeper bus to Siem Reap. I eventually stirred myself and headed out, leaving my luggage stored at the hotel for later. I ended up spending the first couple of hours hiding in Costa, due to the headache and the midday sun. It was cool and quiet in there at least - and filled with other Western tourists of course - and I was able to get caffeinated and use the wifi for a while. All with Westlife as my background music I might add, an interesting choice on behalf of the staff there! The main sight left on my list (because I had no desire to go the museum, based on what I'd read about it) was Wat Phnom, set atop the only hill in the city (not a big one though, I will add). As I think back to it now, since this was around 2 weeks ago that I was there, there isn't anything in particular about it that stands out to me now. While the temples of Angkor I can remember vividly, the various wats in the various towns we visited all started to look the same after a while. The same thing happened to me in France, with all the cathedrals in every town I saw. It's a shame in some ways, but I can't deny that that's what began to happen, although each wat did have its merits, and all were beautifully designed. This one did have a crowd of locals congregating and cooking food in a small pavilion to the side of it though, which was interesting to see the community in action. It wasn't a big wat, smaller than Ounalom I'd say, so my visit didn't take that long. As I was walking back through town, the light-headedness hit again, so I sat down in the park near the Night Market location for a while, and witnessed another interesting sight. Groups of locals sat further up in the shade of the trees - they started begging from me when I walked past later - with many children amongst them. A boy of about seven or eight, came riding down the park on a tricycle he was far too big for, being chased my his little brother, who looked about a year old, and was completely naked. The elder was clearly being a wind-up, but eventually let the younger have a turn on the bike - then promptly steered him into a pile of rubbish, where he capsized, and the elder stole the bike back again! The younger didn't seem hurt or fazed by it, just a bit dirty, and proceeded to chase him back down the path to the larger group. It was a funny little thing to watch, and certainly starts to make you think about the quality of life these people have, especially for those children. Most locals in the city weren't like that, but it was quite a large group under those trees. My final stop of the day was Central Market, a vast complex inside an old building, and spilling out around it. In some ways, it was what I expected it to be; a maze of winding paths crammed with stalls, the owners calling out for you to buy their wares, much like the markets of Hong Kong. However, as I delved deeper, I didn't realise just how much you could get there! There were the usual touristy souvenirs, mountains of clothes and cloth, racks of shoes and hangers covered in bags. But there was also expensive jewellery in glass display cases, piles of fresh fruit and vegetables, every toiletry you might need, and hairdressers and manicurists set up in the middle of it all! Every corner had some new type of goods to peruse. I wasn't out to buy much, only to look, but I did pick up my magnet for Cambodia here (I collect one from every country I visit). From there, I had to kill a few more hours, but I was running out of things to see, and energy to do so. Instead I picked up my bag, and went in search of food and wifi, before going to the bus station to wait for Matt to turn up.